Sick 'em. The vile Jarocho (Sanchez Parra) sends another of his dogs up against Octavio's champion. Like a Mexican Magnolia, Amores Perros is a sprawling tapestry of emotion, weaving together three powerful stories about the hopefulness and pain of love. It's a stunningly made film, raw and authentic, with the ability to get way under the skin. The three stories revolve around a fatal car crash. First we have Octavio (Garcia Bernal), a young man in love with his pregnant sister-in-law Susana (Bauche). To raise money to run off with her, he "borrows" his brother's (Perez) pittbull for a series of vicious dogfights. Second is the story of Daniel (Guerrero), who leaves his wife (Almela) for a model (Toledo) whose gorgeous looks are injured in the car crash ... and whose beloved little dog gets lost under their apartment's floorboards, causing Daniel to question his decisions. 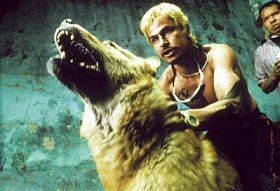 The third story centres on El Chivo (Emilio Echevarria), a dog-loving homeless man and former communist terrorist now working as a hitman, but still obsessed with the daughter (Lourdes Echevarria) he abandoned for the cause. There are more stories and plots woven into the film's structure and, like most of these films, it's assembled out of time sequence, returning again and again to the pivotal accident. The result is absolutely stunning, reflecting the cyclical nature of love and romance, the wandering attentions, self-doubts, misplaced loyalties and most importantly the way true love opens us up to both true joy and dangerous vulnerability. The actors are all startlingly natural--it's like we're watching real life. Mexico City could be any place on earth. And the emotions the characters feel are the very same things we both yearn for and fear. That said, the film is very long, rather repetitive and a bit too violent for us to really identify with the situations these people get themselves into (not many of us face mutilated dogs, bank robberies, gun-toting thugs, assassinations or disfiguring injury on a daily basis). But as a metaphor for the struggles we all go through to find real love and happiness, this is clever, meaningful, moving stuff indeed.